My name is Heather Parker and I'm a Ketogenic Lifestyle Coach. I'm not a doctor or a registered dietitian, I'm just someone who was always sick and forever unhappy with my body. I've been a size 2 at other times in my life but I definitely wasn't healthy or happy. A number on the scale doesn't equate to health or happiness. When I started my journey, I was focused on just losing weight. By feeding my body real food, I found that my health improved. As my health improved, my happiness grew. I made the connection and realized I needed to continue to make all three a priority by doing things that nurtured all parts of my being. My journey started many years ago, probably when I first overheard the word “chubby” while the adults were talking about me. It was the first time I became aware of my body and it was completely unfair because I was just about to go through puberty. I now know as an adult that puberty begins with weight gain, but nobody told that to the “chubby” 10-year-old me. From that moment on, my life revolved around weight and body image. I’ve been every size from a 0 to a 14 and two things never changed: I was chronically ill and chronically unhappy with my body. I look back at pictures of a much younger version of myself and I just want to put my arms around that me and let her know we do eventually figure it all out. The last few years have been eye-opening and liberating. I have spent most of my entire life sick, and not just a little sick, but the type of sick that doctors are mystified by. I knew that eating was a big part of my health so that first year I cut gluten out, I went organic, and fast food was limited to Chipotle or Burgerfi. I watched my family losing weight and having all sorts of great health side effects and I just felt defeated and tired. I thought I was really getting a raw deal, I was doing all of the work, being diligent about what I was eating and I got nothing, nada, zip. I was still sick more days than not and still heavy. I would get on the scale of misery and hold my breath until the digital numbers appeared. So many days ruined all because I got on the scale that morning. It really set the tone for the day I was going to have, especially if I was feeling optimistic about what would be revealed on the scale. If I had dropped a pound or two, it was going to be a great day, I was making progress. If I gained a pound or two, that was a totally different story. I beat myself up. I would dissect every little thing I ate the day before and try to reconcile any exercise I did to negate any of the calories I had eaten throughout the day. None of it made any sense. It was the first time in my life I thought that maybe after 40, this was it. I wasn’t going to ever see a size 8, let alone a 0(! ), again and I was destined to be a sickly senior citizen. 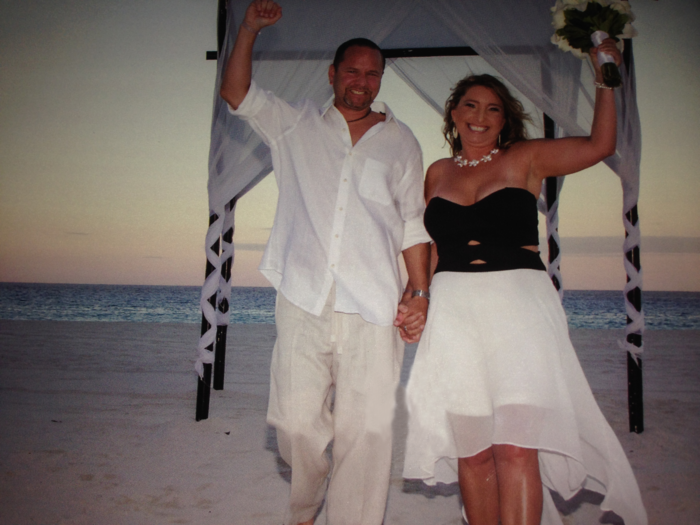 The second year, my husband and I had our 15th anniversary and I booked a spectacular trip to Cancun for us to renew our vows. I booked the trip in March and the trip was at the end of September. I spent 6 days a week at the gym. I would do an hour of cardio and another 45 minutes on weights. I mixed in a lot of cycling, yoga, Pilates and Zumba classes, too. Sometimes, I even did 2-a-days. I was definitely healthier than I had ever been but I became extremely frustrated during those months: I never had any significant losses on the scale. I started at 155 and the lowest number I ever hit during that time was 148. We all carry weight differently, but at 5’3, I carried it everywhere. My face has always been my tell (in more than one way). It’s the first place I gain and lose weight, which would be why I hated pictures of myself. All I could see when I would looked at myself was that chubby girl with the round face. So, during those months at the gym, I did start to feel better about myself because at the very least my fat wasn’t quite as jiggly. We went on our trip and got beautiful pictures taken of my husband and myself renewing our vows. We received the pictures in the mail after we got back from Mexico and that was it for me. I was done killing myself in the gym because, obviously, it wasn’t making much of a difference in my weight. What I imagined the pictures looking like versus what I saw made me so sad. I came to terms with the "fact" that, after a full hysterectomy at 41, I was never going to be the 40-something that looks amazing for her age. I slowly started eating more sugar, gluten-free packaged foods, carbs of all shapes and sizes and soon started to become a shape and a size I had never been before. During those months, I became sickly again. I seemed to be sick with some kind of virus or bug all of the time. I don’t think I ever got up in the morning feeling rested and ready to attack the day. In May, everything came to a head. I topped out at 164 and felt like an old woman. Summer comes early here in Florida so I had to go find shorts that fit. I went to Target to see if I could find something presentable to run errands in. I came home with my first and last pair of 14’s. This was a major turning point. I had hit a brick wall and was miserable every time I had to go into my closet to try to find something to wear other than yoga pants. Forget about going out or anything else that would force me to try on 1⁄2 of my wardrobe just to put something on that didn’t make me look homeless. In April, Danny and I booked another trip back to Mexico for our anniversary in October. So, not only did I not fit in my clothes, I was going to have to be in a bathing suit in 4 1⁄2 months. I had a trip to Vegas planned for the middle of June and a wedding at the end of the month. I knew things had to change. I’m on the computer a lot. I subscribe to a few really good news letters that are chock-full of information for healthy eating and living. One morning in the middle of my crisis, I came across an article by Dr. Jockers about the Ketogenic diet. I had been on every diet in the past. I had done Paleo, Primal, Atkins, low calorie and low fat, cayenne pepper water, etc. You get the picture. I had never heard of the Ketogenic diet and started doing some research of my own. I was already convinced that we had all been lied to about fats and knew wheat, whole or otherwise, wasn’t good for our bodies. I had read Wheat Belly, watched documentaries like Food Inc., and spent many hours searching the internet for information on healthier living. Needless to say, I was primed for this information and new way of life (I have a hard time calling it a diet). I started reading about all of the health benefits people were gaining when they changed their eating. I figured it was worth trying, although I really didn’t necessarily believe it was going to help. I had no idea that what I was about to embark on would not only change my life, but it would potentially change the lives of so many around me. It’s now been a few years and my life has transformed into so much more than I could’ve ever hoped for. I immediately started losing weight. I never had any big drops on the scale but I was consistently losing 1-2 pounds a week from the start. After the first month, I realized I wasn’t feeling sick anymore. I was more active, getting more done in a day, not feeling rundown or tired, and actually looking forward to participating in my life. The scale no longer scared me. I weighed myself every day and it wasn’t depressing. In fact, the scale was reflecting the changes I was seeing in my body. I really wish I had taken measurements when I first started because I could feel my body shrinking. It was so much more than just losing weight. I was becoming a fat burner. From day to day, it seemed as though I was losing size faster than the scale was showing. I had a vague idea of what my measurements were from the previous summer when I was in the gym, so I used those as my starting measurements (I suspect that I was probably even bigger than those measurements because I was bigger than the summer before). Now, a few years later, I’m a size 0-2 (depending on where I’m getting my clothes). I lost 8 inches in my waist, 5 inches in my thighs, down 3 inches in my arms, and went from a 36 G bra to a 34 D. I have dropped a total of 50 pounds and am thrilled to be 114-117 on any given day. The fluctuations of 3-4 pounds is normal for me at any weight and is usually contributed to by what I’ve eaten in the previous day or two. Eating out, even the healthiest choices, always seem to cause a 2 pound temporary gain on the scale. After two days, I’m back to where I should be. Over the last year, I regained my health. Actually, I’m healthier than I’ve ever been in my entire life. Now when I go to the gym to do Pilates or Yoga, it’s because I want to, not because I’m desperately trying to work off the pounds. During the first years, I incorporated so many things into my lifestyle. I changed what I ate, when I ate it, and added meditation into my routine. I am at peace with myself and the world around me. I don’t think weight equates happiness but I do know that not hating myself for being sick, tired, and fat really helps the happy. I feel empowered knowing the food I choose to put in my body will only help me continue to be healthy. I have taken my health back. I have control over my weight. I have my happy. The key for me is knowing that it starts with the food.